IINSTAGRAM: @ultimatefitnesscentergym @Regran_edfrom @stetsonfry – Taking a step back today from the brute strength work and instead focusing on stability and efficiency. The landmine rotations followed my lateral raises, so by this time my shoulders are already fatiguing. I want them to hold on tight, dont move, and just channel that energy exploding from my legs and obliques. If you guys try this one, I personally recommend using a sub-maximal load. Instead of adding more and more plates to the bar, try to drive off your legs quicker with more explosiveness. This one should look violent, not slow and controlled. I wanted just the opposite for the battle rope. Now my core isometrically holds and I’m trying to rip it hard and fast with my shoulders to really burn out and end the workout. You can tell that my shoulders are done because I’m overcompensating with my bicep a little more than I would prefer. It’s ok though, the point is that after 4 rounds of 30 seconds per arm, my shoulders and core were spent. Keep training hard, guys! Warm up Sampson Stretch (hold each side for 15 seconds) 15 Overhead Squats with Bar 15 Sit-Ups (modify with knee tucks if needed) 15 Back Extensions 15 Push-Ups (modify on knees if needed) Workout 30 (10 Jumping Jacks…5 Kicks L/R) 2-3 Sets 20 (10 Squat to Knee Strike…10 Lunges) 15 (5 Get-Ups…10 Sitting Cross Crunch) x3 10 Superman Push-Ups 15 Knee-Tuck Transfers (8-10 to modify) 2-3 sets 20 (10 Back Squats…10 Split Jerks) 30 Plank Challenge (20-60 sec) Video Demonstrations Come Join UFC Fighter Chris “The Crippler” Leben at Ultimate Fitness to film the commercial for the Core Specific Boot Camps! 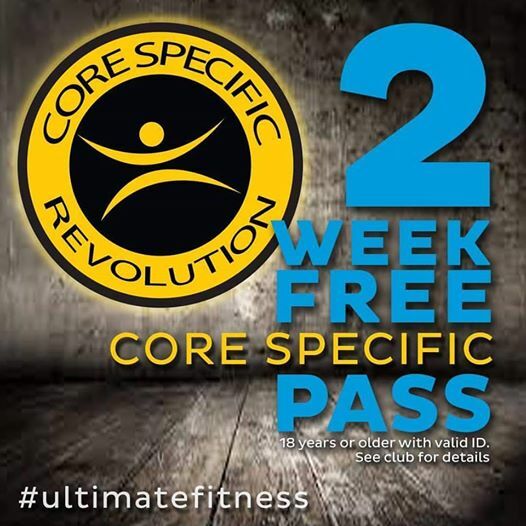 Core Specific Revolution is the next big thing in fitness. 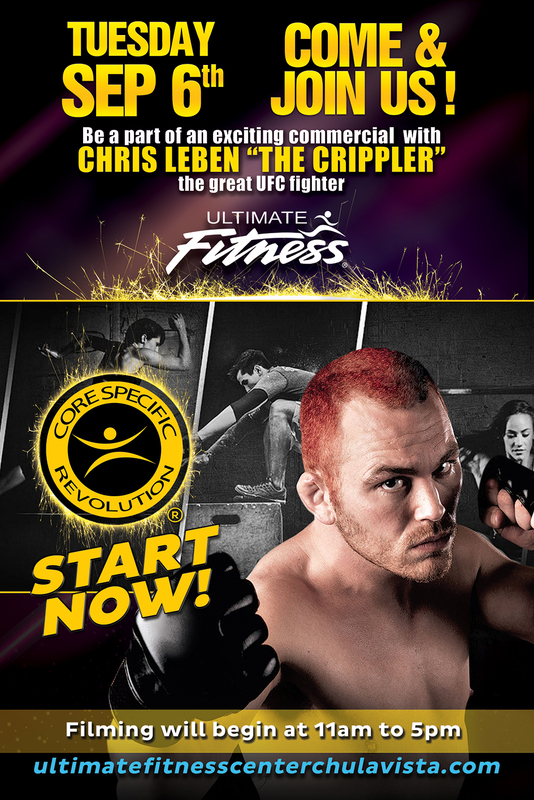 Be apart of the excitment and get ready to take your fitness journey to the next level and train like a fighter/athelte and reach your goals and peak performance.